I honestly never thought I would be putting this page up, but in recent weeks Police Chiefs around the country are openly stating that "armed" Americans help present crime, not increase it! Given that most Americans who own a gun never commit a crime with that gun, WE Thank You! Detroit’s new police chief has seemingly made an immediate impact. The murder rate dropped by almost 14% in 2013 from its record breaking high in 2012, and the police department’s rate of clearing murders has climbed in that time as well. Now he’s talking openly about another way to lower the crime and murder problem… arming law abiding citizens. 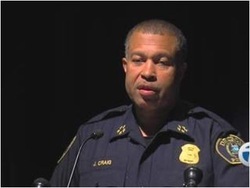 When we look at the good community members who have concealed weapons permits, the likelihood they’ll shoot is based on a lack of confidence in this Police Department,” Craig said at a press conference at police headquarters, adding that he thinks more Detroit citizens feel safer, thanks in part to a 7 percent drop in violent crime in 2013. The International Association of Chiefs of Police (IACP) has announced its strong support for The Public Safety And Second Amendment Rights Protection Act. U.S. Senators Pat Toomey (R-Pa.) and Joe Manchin (D-W.Va.) are sponsors of the bill that will prohibit a national gun registry, allow concealed carry permit holders to skip background checks altogether, and enable active duty military to buy a gun in their home state. The bill can be read here. The International Association of Chiefs of Police (IACP) today announced its strong support for the "Public Safety and Second Amendment Rights Protection Act" (also known as Manchin-Toomey.) The legislation would increase both the coverage and effectiveness of the current background check system and help deny criminals and other prohibited purchasers easy access to firearms. "Background checks work," stated IACP President Craig Steckler, "Keeping firearms out of the hands of prohibited purchasers is a key factor in reducing gun violence in our communities and protecting our officers. For far too long, those who were denied the ability to buy a firearm from a commercial dealer were able to secure a weapon at either a gun show, over the internet, or some other form of 'private sale'. Under the provision of Manchin-Toomey, we have the opportunity to finally close many of these loopholes and, as a result, reduce the level of violence faced by our officers and our citizens on a daily basis." In addition, to announcing its support for Manchin-Toomey, the IACP also reaffirmed its support for the "Stop Illegal Trafficking in Firearms" Act which will also be considered by the Senate in the near future. 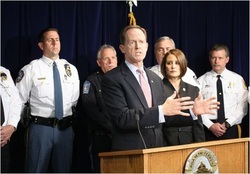 This legislation provides law enforcement officials with the tools we need to investigate and prosecute gun traffickers and straw purchasers, who buy guns for people who are prohibited from obtaining them on their own. "Straw purchasing and firearms trafficking puts guns into the hand of those that are prohibited from possessing them," stated Steckler. "The ability to effectively target straw purchasers is critical to protecting our communities." The IACP is confident," concluded Steckler, "that these provisions, combined with the enhanced background check system outlined under Manchin-Toomey, will help reduce violence and save lives in our communities." The International Association of Chiefs of Police is the world's largest association of law enforcement executives. With over 21,000 members in more than 100 countries, the IACP serves as the professional voice of law enforcement. Building on their past success, the IACP addresses cutting edge issues confronting law enforcement through advocacy, programs and research, as well as training and other professional services. IACP is a comprehensive professional organization that supports the law enforcement leaders of today and develops the leaders of tomorrow.